If you are looking for a twin bed with modern style; there are so many modern twin beds available with different designs and material. These beds can fit easily into small rooms because of the twin size and adds a new style in the decoration. Grace your bedroom décor with contemporary and warm feel of DG Casa Lexington Platform Bed. This stunning bed features an elegantly designed button tufted headboard, rails with stitches that radiates a chic look, slats and center legs (2 center legs in queen size bed and 4 center legs in king size bed) for stability and support. Lexington Upholstered Platform Bed collection. Platform bed constructed from manufactured wood. 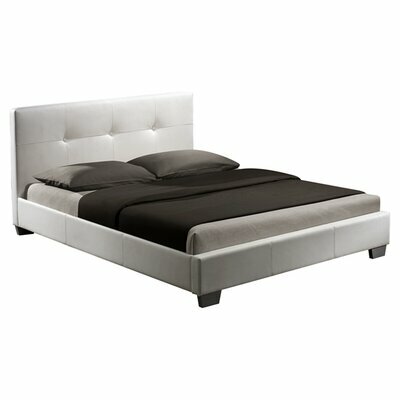 Bed frame is completely upholstered in durable and appealing synthetic leather. Two center legs for additional support and stability. Other Bottom of Side Rail to Floor: 4"
This appealing Skyline Furniture Nail Button Upholstered Panel Bed will enhance your bedroom décor. The panel bed is constructed from solid pine wood and features an artistic linen upholstered headboard with slick metallic nail heads which will complement your bedroom and enhance the look with its unmatched quality and stylish yet sophisticated design. Nail Button Upholstered Panel Bed collection. Headboard, footboard and slat included. Box spring (required not included). Stylish and elegant are the right terms to describe this gorgeous Modloft Madison Platform Bed. The sturdy European styled Modloft Madison Platform Bed features solid hardwood constructed bed frame, hand-woven leather headboard with traditional and cottage appeal of white, dusty gray or coffee finish. This stunning bed is sure to accentuate the look of your bedroom décor with its beautifully handcrafted headboard with sophisticated overlapping design. Stylish overlapping hand-woven leather headboard. Perfect design of Skyline Furniture Premier Upholstered Panel Bed is an excellent choice for your contemporary master bedroom. This gorgeous panel bed features a metal bed frame and a stunning headboard that is padded with plush polyurethane foam and covered with a soft micro-suede material. The bed is handcrafted in USA from premium-quality materials and is CARB complaint to ensure indoor air sanitation. Premier Upholstered Panel Bed collection. 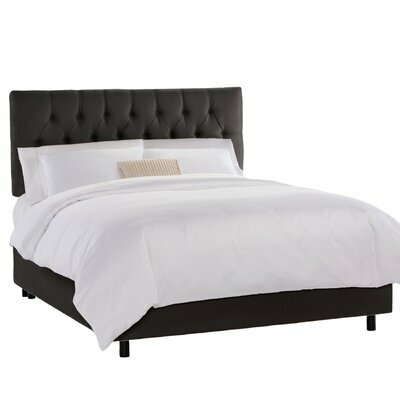 Classy headboard is covered with a soft micro-suede material and filled with plush polyurethane foam. Product care: Headboard can be cleaned with a damp cloth. The Maxwell Upholstered Platform Bed is a contemporary style product which will prove to be a perfect addition to your beautiful and modern bedroom décor. The compact dimensions of the bed enable it to fit perfectly into the small bedrooms. This platform bed features a minimalistic appearance with thickly padded headboard which is excellent for leaning back on it and watching TV or reading your favorite book. Maxwell Upholstered Platform Bed collection. Available in 3 finishes: White, Grey and Flannelette Grey. Thickly padded leather upholstered headboard. Accentuated the décor of your bedroom with this elegant Modus Ledge Platform Bed (headboard not included but can be purchased separately). The minimalist appearance of this bed renders your bedroom an elegant and warm feel. 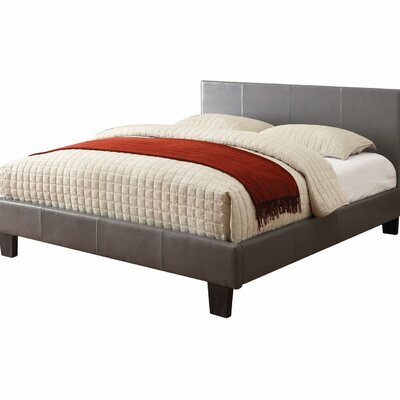 The bed features wooden frame upholstered in textured Chocolate faux leather and center support legs. This simple yet sturdy bed is available in different sizes. Use a damp soft cloth for wiping and dry soft cloth for drying. Avoid using household cleaning chemicals. Modus Ledge Upholstered Platform Bed collection. 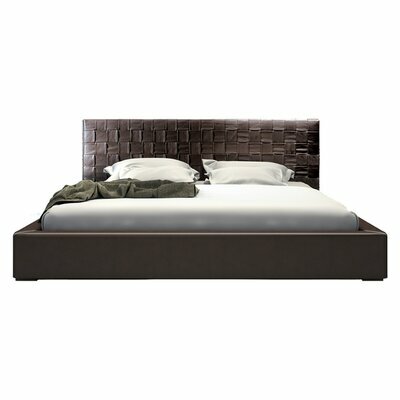 Bed frame is upholstered in textured Chocolate faux leather. 3 different styles of Ledge headboard available (sold separately). Product care: Use a damp soft cloth for wiping and dry soft cloth for drying. Avoid using household cleaning chemicals. Sturdy and attractive Hazelwood Home Panel Bed will give your bedroom a modern yet classy and comfortable look. This gorgeous contemporary bed is fully covered in warm brown PVC which radiates an appealing contemporary-casual style aura to complement your beautiful bedroom décor. Fully covered in warm brown PVC. 3 slats placed at the head, the center and the foot of the bed. 1 year product warranty for parts. The sturdy and stunning InRoom Designs Upholstered Platform Bed will add a style quotient to your bedroom décor with its elegant and rich Espresso brown finish. This stylish bed features solid wooden construction for years of reliable use and horizontal slats with center support legs for stability and additional support. The number of center legs varies according to the size of the beds. The platform bed is CARB compliant as it is made from non-toxic and eco-friendly material. 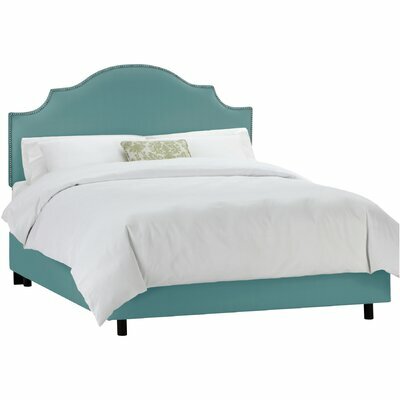 Tufted and rounded curve shaped headboard. Upholstered headboard with a tufted design. Rib seats and center pole with additional support legs. Other Bottom of Side Rail to Floor: 10"
Create a stunning focal point in your bedroom with this gorgeous and stylish Naples Platform Bed. You can choose the entire set, individual Naples Platform Bed or any of the case goods and enhance the décor of your bedroom with this fashionable and chic collection. The case goods are manufactured from plantation grown solid wood (no rainforests are harmed) and are equipped with full extension glides to ensure best quality. Modus Nevis Riva Platform Storage Bed blends functionality with exotic contemporary design in this rich Espresso finish platform bed with brushed chrome hardware. 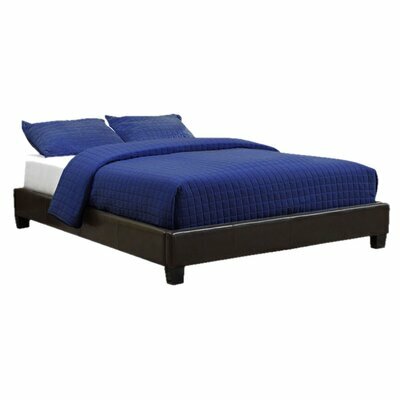 This bed is crafted from Tropical Mahogany solids and a variety of beautiful veneers for its sturdy as well stylish look. The Nevis collection bed features four under bed drawer boxes with English dovetail joints on both front and back, full extension ball bearing drawer glides, and are also corner blocked for rigidity and stability. Nevis Riva Platform Storage Bed collection. Rich Espresso finish and brushed chrome hardware. Constructed from Tropical Mahogany solid wood and veneer. Perfect design enable usage with or without box spring. Four massive under bed storage drawers. Drawer glides with full extension ball bearing. Corner blocked for rigidity and stability. 12 solid wood slats with 1 center slat and center legs. 13″ clearance from the ground to the bottom of the slats.